So far, The Blot’s favorite new figure of 2018 is this awesome Sofubi-man vinyl figure by Mark Nagata and Max Toy Company! Sofubi-man is Nagata’s homage to the men and women who cast soft vinyl in Japan. Best of all, he comes holding an iron mold, which is used to cast the figures we all love and collect. 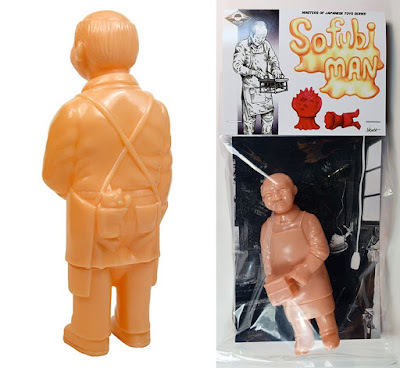 Sofubi-man was magically sculpted by Cristina Ravenna, with Max Toy coordination by Yo Miyamoto and of course expertly cast in Tokyo by real Sofubi-men. Each figure stands 6” tall and features one point of articulation at the neck. 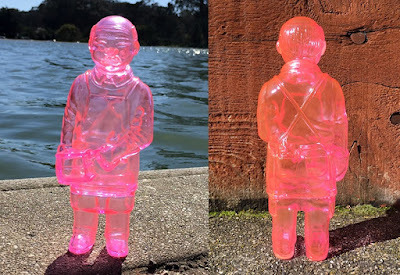 So far, this magical figure has been released in three unpainted colorways: Flesh ($35), Glow in the Dark ($39) and Clear Pink ($40). While the first two colorways are now sold out, the unpainted translucent pink edition is available now at the Max Toy Co online store!